Esmaeili, S., Ara, L., Hajimehdipoor, H., Kolivand, H., Mohammadi Motamed, S. (2015). Acetylcholinesterase inhibitory effects of some plants from Rosaceae. Research Journal of Pharmacognosy, 2(4), 33-37. S. Esmaeili; L. Ara; H. Hajimehdipoor; H. Kolivand; S. Mohammadi Motamed. "Acetylcholinesterase inhibitory effects of some plants from Rosaceae". Research Journal of Pharmacognosy, 2, 4, 2015, 33-37. Esmaeili, S., Ara, L., Hajimehdipoor, H., Kolivand, H., Mohammadi Motamed, S. (2015). 'Acetylcholinesterase inhibitory effects of some plants from Rosaceae', Research Journal of Pharmacognosy, 2(4), pp. 33-37. Esmaeili, S., Ara, L., Hajimehdipoor, H., Kolivand, H., Mohammadi Motamed, S. Acetylcholinesterase inhibitory effects of some plants from Rosaceae. 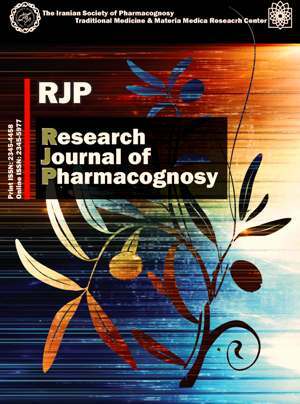 Research Journal of Pharmacognosy, 2015; 2(4): 33-37. 2Department of Traditional Pharmacy, School of Traditional Medicine, Shahid Beheshti University of Medical Sciences, Tehran, Iran. 3Traditional Medicine and Materia Medica Research Center, Shahid Beheshti University of Medical Sciences, Tehran, Iran. Pharmaceutical Sciences Branch, Islamic Azad University, Tehran, Iran. 4Pharmaceutical Sciences Branch, Islamic Azad University, Tehran, Iran. Background and objectives: Alzheimer's disease (AD) is an age dependent disorder. AD is associated with decrease of brain acetylcholine level. Nowadays, one of the methods for progression inhibition of AD is using acetylcholinesterase inhibitors. Rosaceae is a large plant family. Different biological effects of some species of this family have been reported. The aim of the present study was to assess the acetylcholinesterase inhibitory (AChEI) activity of the selected plants belonging to Rosaceae family. Methods: AChEI activity of six species from Rosaceae including Cotoneaster nummularia, Cerasus microcarpa, Amygdalus scoparia, Agrimonia eupatoria, Rosa canina and Rosa damascena were evaluated based on Ellman’s method in concentration of 300 µg/mL using total extracts and methanol fractions which were obtained by maceration. Results: The results showed that the total extract and methanol fraction of the aerial parts of A. eupatoria demonstrated significant AChEI activity with 46.5% and 56.2% inhibition of the enzyme, respectively. Conclusion: According to the results of the AChEI activity of the methanol fraction of A. eupatoria, it seems that the polar components of the species such as flavonoids may be responsible for its effectiveness. Hummer KE, Janick J. Rosaceae: taxonomy, economic importance, genomics. In: genetics and genomics of Rosaceae, plant genetics and genomics: crops and models. Folta KM, Gardiner SE, Eds. New York: Springer Science, 2009. Schulz V, Hansel R, Blumenthal M, Tyler V.E. Rational phytotherapy. Berlin: Springer, 2004. Fatthi S, Jamei R, Hosseini Sarghein S. Antioxidant and antiradical activities of Rosa canina and Rosa pimpinellifolia fruits from West Azerbaijan. Iran JPlant Physiol. 2012; 2(4): 523-529. Boskabadi MH, Shafei MN, Saberi Z, Amini S. Pharmacological effects of 99 Rosa damascena. Iran J Basic Med Sci. 2011; 14(4): 295-307. Gaggeri R, Rossi D, Christodoulou M, Passarella D, Leoni F, Azzolina O, Collina S. Chiral flavanonoes from Amygdalus lyciodes Spach: structural elucidation and identification of TNF alpha inhibitors by bioactivity-guided fractionation. Molecules. 2012; 17(2): 1665-1674. Tabet N. Acetylcholinesterase inhibitors for Alzheimer٬s disease: anti-inflammatories in Acetylcholin clothing. Age Ageing. 2006; 35(4): 336-338. Shekarchi M, Hajimehdipoor H, Naghibi F, Ara L, Moazzeni Zehan H. Investigating acetylcholinesterase inhibitory effects of some Ferula species. J Med Plants. 2013; 12(46): 106-112. Soodi M, Naghdi N, Hajimehdipoor H, Choopani S, Sahraei E. Memory-improving activity of Melissa officinalis extract in naïve and scopolamin-treated rats. Res Pharm Sci. 2014; 9(2): 107-114. Hajimehdipoor H, Naghibi F, Bandidarian A, Moazzeni Zehan H, Pirani A, Hamzeloo-Moghadam M. Evaluating the antioxidant and acetylcholinesterase inhibitory activity of three Centaurea species. Res J Pharmacogn. 2013; 1(1): 33-37. Ellman GL, Courtney KD, Andres V, Featherstone RM. A new and rapid colorimetric determination of Acetylcholinesterase inhibitor activity. BiochemPharmacol. 1961; 7: 88-95. Uriarte–Pueyo I, Calvo MI. Flavonoids as acetylcholinesterase inhibitors. Curr Med Chem. 2011; 18(34): 5289-5302. Olin J, Schneider L. Galantamine for dementia due to Alzheimer’s disease. Cochrane Database Syst Rev. 2002; 3: CD001747. Beri V, Gupta R. Acetylcholinesterase inhibitors neostigmine and physostigmine inhibit induction of alpha-amylase activity during seed germination in barely, Hordeum vulgare var. jyoti. Life Sci. 2007; 80(24-25): 2386-2388. Jung M, Park M. Acetylcholinesterase inhibition by flavonoids from Agrimonia pilosa. Molecules. 2007; 12(9): 2130-2139. Jahanban- Sfahlan A, Mahmoodzadeh A, Hasanzadeh A, Heidari R, Jami R. Antioxidant and antiradicals in almond hull and shell (Amygdalus communis L.) as function of genotype. Food chem. 2009; 115(2): 529-533.